Your door can transform the look of your home, it’s one of the most stand out features to your house, and it’s one of the things any guests first notice. Your front door can give a particular portrayal on your home and can change the perception people have on your residence. There are many different types of doors to choose from with all different materials, designs and insulation methods. Choose from UPVC, French, patio, bi-folding or composite. All of these doors are matched better for certain uses or properties, for example, a patio door may be more practical as access to your back garden as opposed to being used as your front door. So what are these uses? What door is best for your home? Composite doors are recently overtaking the popularity of typical UPVC doors, why is this? 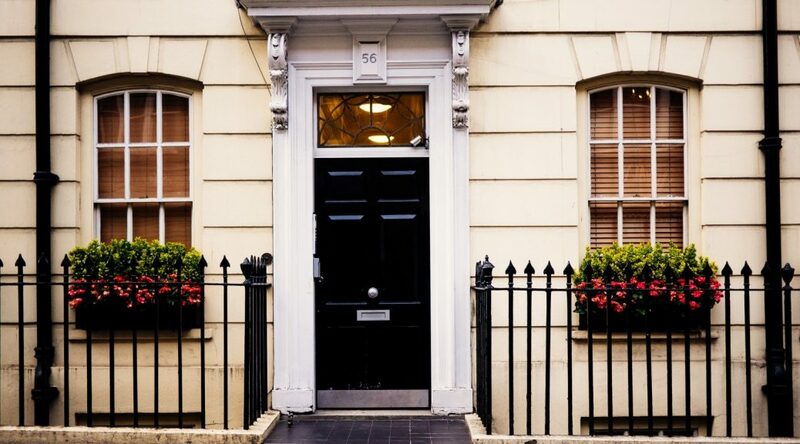 What are some composite door benefits? If you want to find out – then keep reading! Are There Many Composite Door Benefits? Composite doors have way more advantages that disadvantages – fact. In fact, there are actually next to no negative points regarding composite doors; they are slowly beginning to overtake popularity against the traditional UPVC doors. UPVC doors are criticised as being used as front doors, due to their lightweight properties. Safety in your home is essential if you don’t feel safe then you know something with your home isn’t right, and having a badly made or old door can leave your home vulnerable to things such as break-ins. The main benefit of Composite Doors are that they can improve the safety of your home massively, they are created by a mixture of materials being pressed and glued together at a high pressure. These materials are chosen based upon their specific properties and are pieced together to abolish flaws that are found in single doors. Composite doors also are reinforced with a layer of plastic veneer; plastic veneer is a type of laminate that is used to help reduce damage to the object it is coated in. Combined with its already sturdiness this door is practically impossible to damage due to its exposure to everyday wear and tear along with all its durable properties. As an alternative, you could invest in a different variety of GRP doors in Milton Keynes; GRP composite doors involve the same process as plastic veneer layers except fibreglass is mixed in with the plastic to boost the durability of your composite door. The fibreglass not only helps your door withstand its harsh battle against everyday wear and ear, but it also finishes it off with a natural grain. Another home safety element of composite doors is that you have some of the most advanced, state of the art lock mechanisms available to you on the market. Composite doors are used as front doors and back doors, so the selection of locking mechanisms you have available to you is bigger, and you can choose a mechanism as complex or simple as you please. The final home stability point of this super safe door is that inside there is usually a steel frame alongside the insulation materials that help keep your door up and completely straight; this frame is then reinforced with hardwood to add extra durability to the frame. These doors can last up to 35 years if oiled every few months and maintained in good condition; they’re also a longer lasting alternative to just ordinary wood! The middle of a composite door can contain any insulating materials such as wood, that is then protected by a durable weather resistant outer shell. Wave goodbye to overpriced energy bills too! Not only is a composite door excellent at withstanding harsh conditions, but it is also eco-friendly and can, in the long run, save you a lot of money! Not having to replace your door yearly is going to save you money in the long run anyways, but with a well-insulated eco-friendly door you energy bills will begin to drop. The secret to it’s insulating properties are held inside of the door; a polyurethane foam is injected into the core to insulate your door and keep your home warm and insulated in the cold winter weather. For complete home insulation why not pair your new door with some new windows in Milton Keynes? Slide Sash windows are the perfect insulators for your home are aesthetically pleasing for your home. The only downside to this door is that it is slightly more expensive as opposed to UPVC or wooden doors, however, you will save money in the long run from insulation. Because this door is so excellent at withstanding harsh conditions it rarely needs any repairs or maintenance. It is only necessary to oil the hinges and wipe it down with warm soapy water every few months to keep it in top condition, as opposed to UPVC doors that need a strict regular cleaning regime to keep them in working order. The thing that is most likely to receive any damage on your door are the glass panels, in the rare cases where damage does occur to your composite door, the glass panels are built into a frame which allows them to be easily switched in the event of damage. Not only does this make the process of repairing the windows significantly faster but also easier. These doors are also prone not to swell during wet weather, meaning, therefore, they are very unlikely to become squeaky or stiff. These doors can be paired with any house design and are created to look good on all properties, if you wanted to paint your door it is entirely fine. However, you do not need to as the doors natural wood can withstand the conditions. Also, there are lots of different door designs that you can choose from, complete wooden ones with glass panels and lots of various wooden shades and finishes. So that concludes the benefits of Composite Doors and how they can help your home, at Crown we have a variety of doors in Milton Keynes that you can choose from, each with different designs or benefits for your home. We hope you liked this article and found it helpful, if so then why not share amongst your friends?